Enraged Enderman is a hostile mob found exclusively on EMC. Its release was part of the second phase of the Survival Updates. 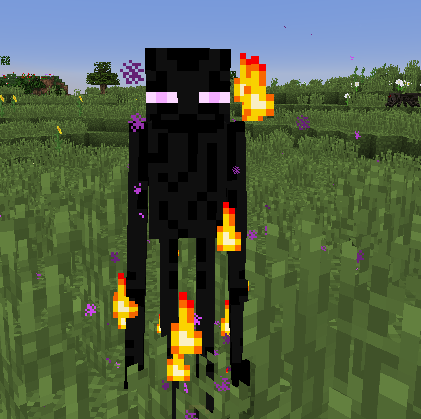 This mob is a faster, stronger, and rarer version of the normal Enderman. It can be distinguished from normal Endermen by its fiery particle effect. It is aggressive rather than neutral, meaning you do not need to look into its eyes or deal damage to initiate conflict, and a pumpkin helmet won't protect you from his aggression. Ender Energy obtain from its Charged Pearl drop, which is also dropped by Enraged Guardian (Enderman), is essential to efficiently killing Eyender.